Celebrated in song, national symbols, historic textiles, engravings and heraldic shields, grapes are the very essence of Autumn across most of our known world. The top photo, dated 1946, at left is from my Transylvanian family album. Mama is the proud holder of a huge bunch of grapes. Our Opa was a vintner so the harvest was always a big deal, celebrated not only by the adults but us children. After the grapes were gathered, fires were made, meat roasted, and everyone enjoyed grapes or wine, music, good food, and lots of conversation, games, teasing and laughter. It was the year before the Iron Curtain came down over Romania and with it, the end of our grape harvests. In 1947 we left for Austria. Even though it was the end of an era for us, today grapes are grown on sun drenched hillsides for table and a large variety of wines – from Australia to Europe and the Americas. bottom the NEW Grape with Leaf Table Runner 41″ long by 15″ wide, available in all stock colors shown above. 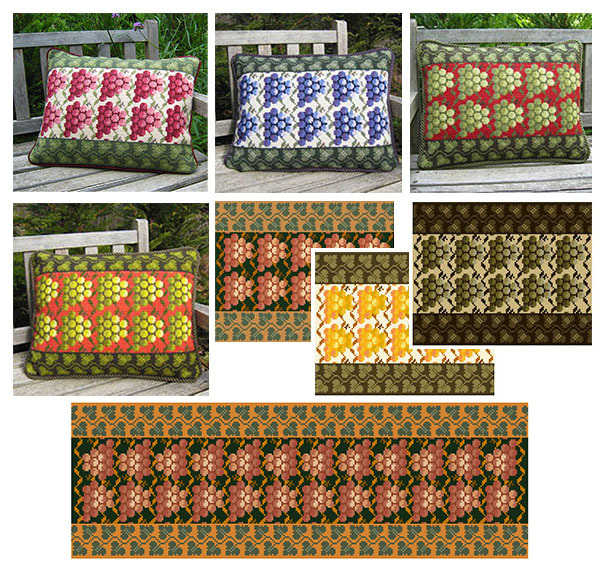 For more color schemes for stitching now, please visit Color Schemes – Autumn/Early Winter. This entry was posted in Autumn/Early Winter, cross-point Color Schemes, cross-point kits, grape pattern, new cross-point patterns and tagged About cross-point, Autumn Colors, color schemes for stitching, cross stitch kits, crosspoint kits, Interior Design, needlepoint kits, new patterns, Sieglinde Anderson Designs, Transylvania grape harvest. Bookmark the permalink.